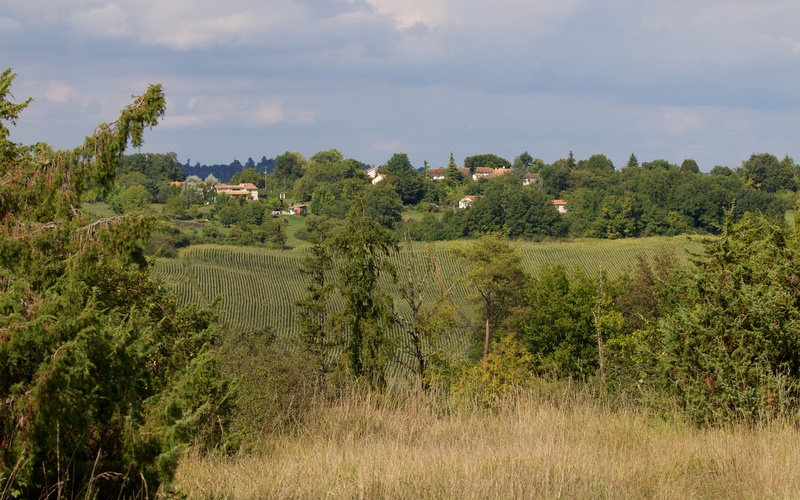 The small village of Argentine, so small it is now linked with nearby Rochebeaucourt as La Rochebeaucourt-et-Argentine, sits peacefully at one end of a long limestone plateau above the river Nizonne looking over the rolling hills of the Charente to the west. The plateau is a great grey whaleback with ancient, wooded Argentine at its head, an open patch of grassland with small aerodrome in the centre, extensive blackthorn (Prunus spinosa) and juniper (Juniperus communis) scrub giving way to downy oak (Quercus pubescens) woodland beyond, and finally a huge limestone quarry rudely cutting away at its tail. The old, recently restored, church at Argentine from the plateau; a view that has probably changed little in many centuries. The main road between Angoulême and Riberac runs down the Nizonne valley winding beneath both villages and then running adjacent to chalk cliffs and large caves with the plateau above. The airstrip is marked out by white-painted stones across the undulating grassland; a tatty windsock twitches at one end in the occasional light breeze. 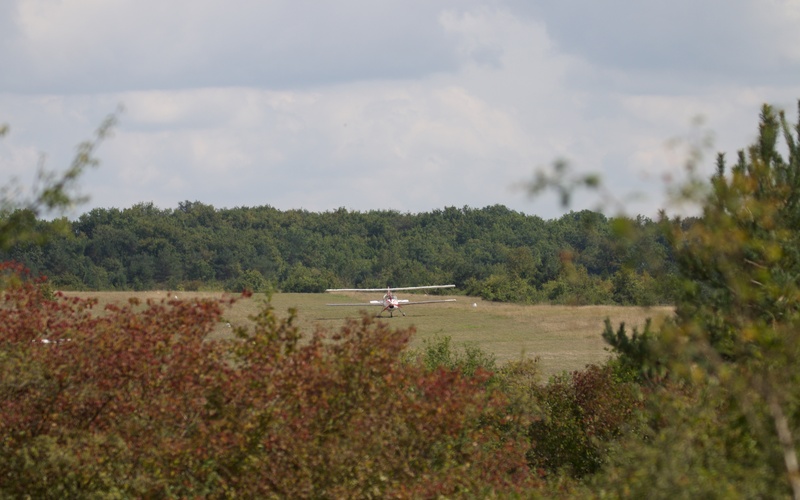 There are a couple of small hangars that house small white aeroplanes; one is checked over by its pilot after landing without a bump. The afternoon in late August is hot and there is no shade from the sun that bakes the rock and desiccates the plants. The bumpy airstrip on the Plateau with scrub and downy oak woodland beyond. The Plateau d’Argentine is another ‘Natura 2000’ protected area. The INPN database accessed here lists the mosaic of limestone habitats for which the site qualifies as being of European importance: calcareous grasslands, some orchid rich; pseudo-steppes which are short, sparse, grasslands on harsh rocky substrates rich in therophytes (annuals that survive the winter as seeds); shrub grasslands dominated by tall juniper; and cliffs with box (Buxus sempervirens). Juniper scrub and calcareous grassland; the march of the sunflowers and maize leaves patches of natural habitat such as this increasingly isolated and fragmented in the landscape. The key qualifying species are however not found in these habitats but in one or more of the caves that have been quarried or enlarged in amongst the cliffs on the side of the hill. These hold a rich community of hibernating bats including two horseshoe species, two mouse-eared species, Geoffroy’s and barbastelle. Whatever the official documentation says, the location appears to be most renowned for its 25 species of orchids and rich butterfly assemblage. 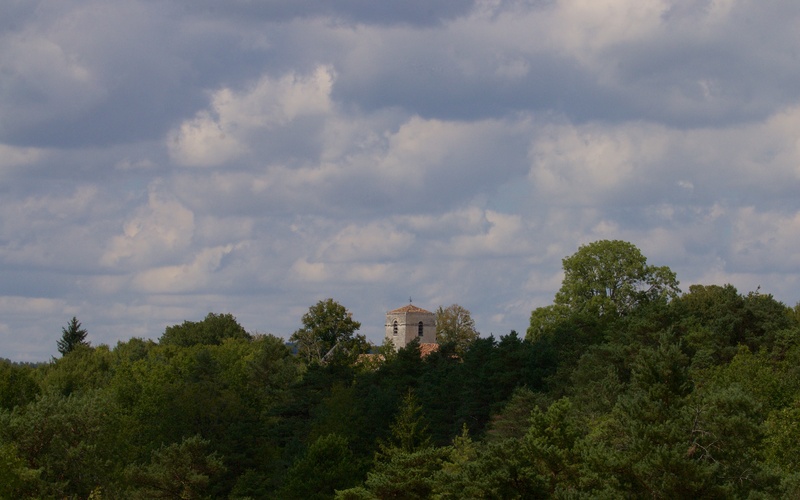 The Parc Naturel Régional Périgord-Limousin has produced a most informative online booklet about the protected area. The short grassland is covered in slender pink spikes of autumn squill (Prospero autumnale) and there is still a wide range of butterflies feeding on them and other flowers. Small heath (Coenonympha pamphilus) is most numerous of all and large skipper (Ochlodes sylvanus) is common. 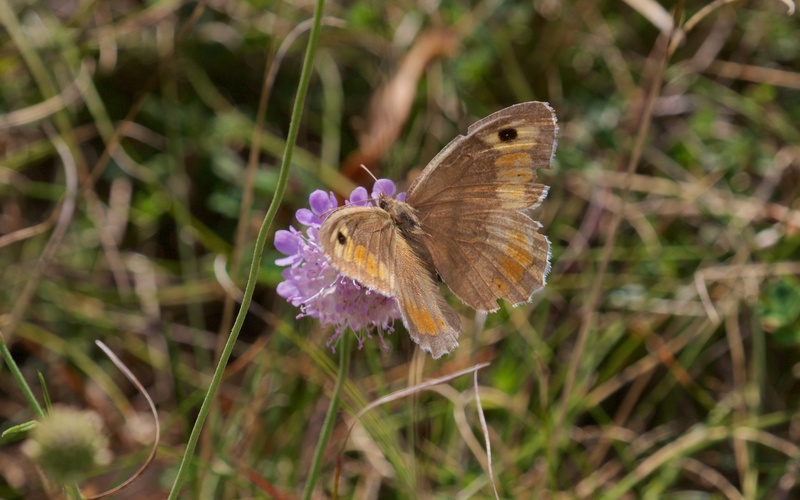 False grayling (Arethusana arethusa) is both abundant and approachable in the sheltered grasslands amongst the scrub. 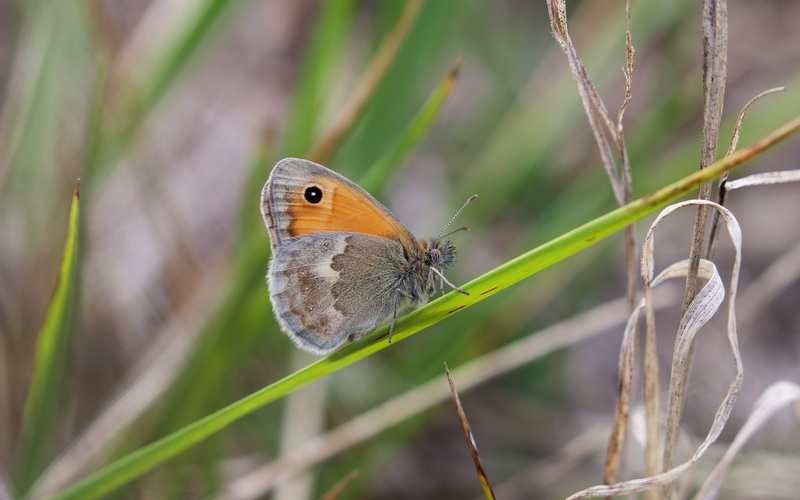 Small heath were abundant in the ranker grasslands. 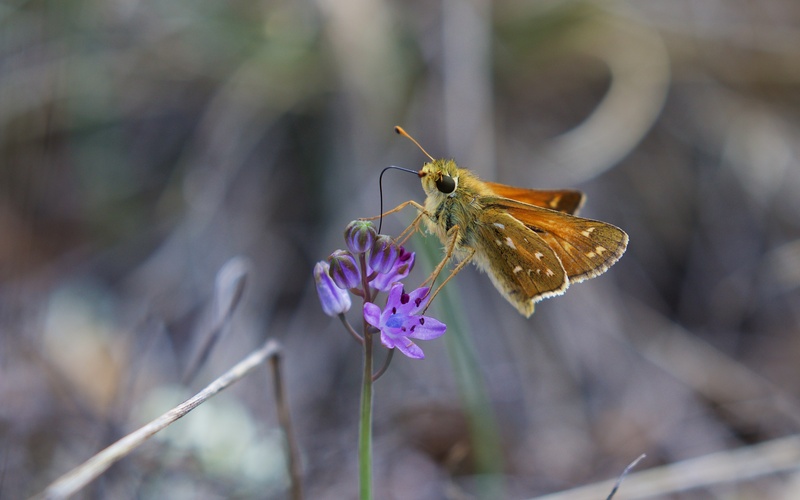 Large skipper on autumn squill. 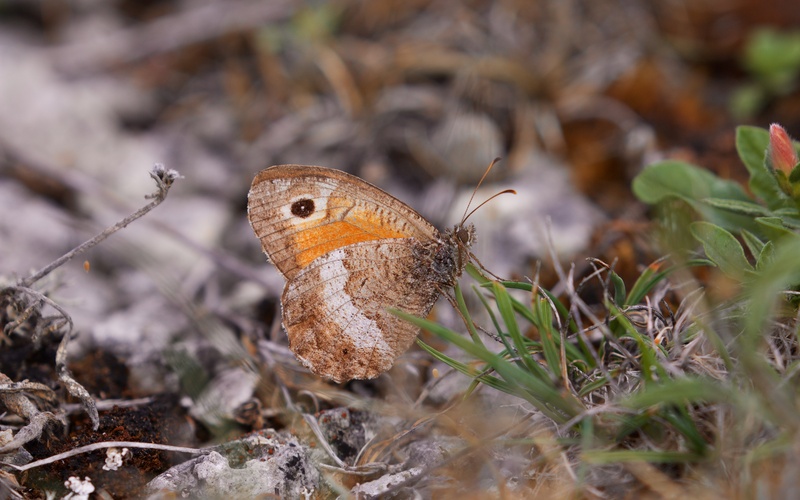 False grayling; the underside at a distance may be confused with meadow brown (Maniola jurtina). The upperside is distinctive with golden brown bands that flash in flight. Glanville (Melitaea cinxia) and spotted fritillaries (Melitaea didyma) are both present in small numbers. 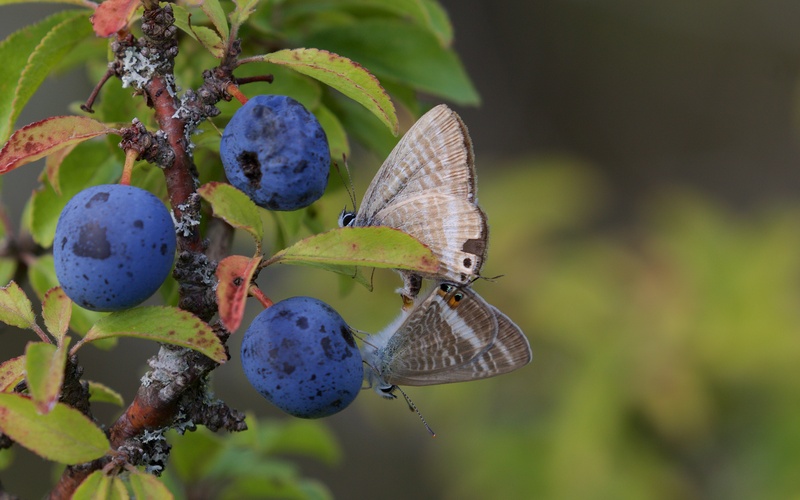 A mating pair of long-tailed blues are stuck together on the abundant sloe (Prunus spinosa). Great banded grayling (Brintesia circe) is also present and a male chases a female deep in the scrub; I see her abdomen raise and they flutter up the tree; the male at last giving up the chase to perch on the trunk and perhaps watch for another more willing partner. 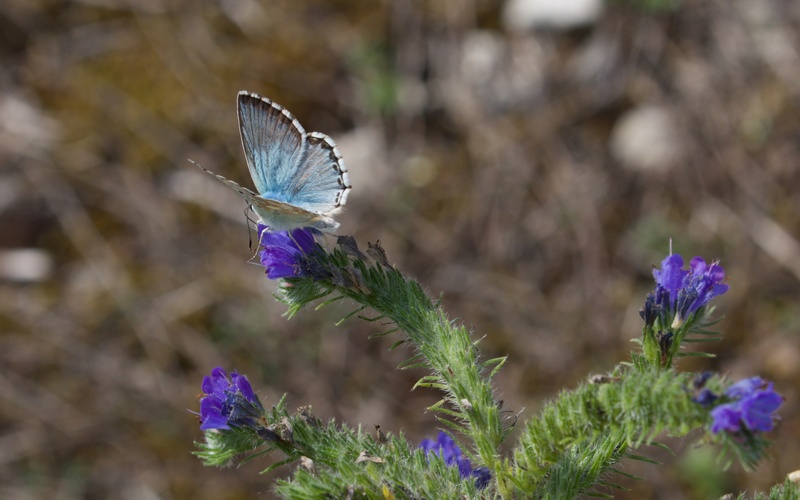 Chalkhill (Polyommatus coridon) and Adonis blues (Polyommatus bellargus) are both common and hustle over prized food plants such as viper’s bugloss (Echium vulgare). Long-tailed blues mating on sloe. 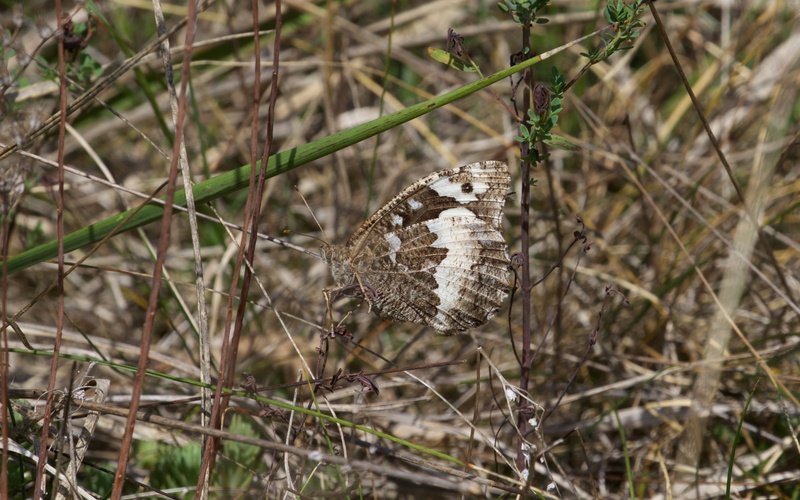 Great banded grayling well camouflaged in the dry grassland. Chalkhill blue male on viper’s bugloss. 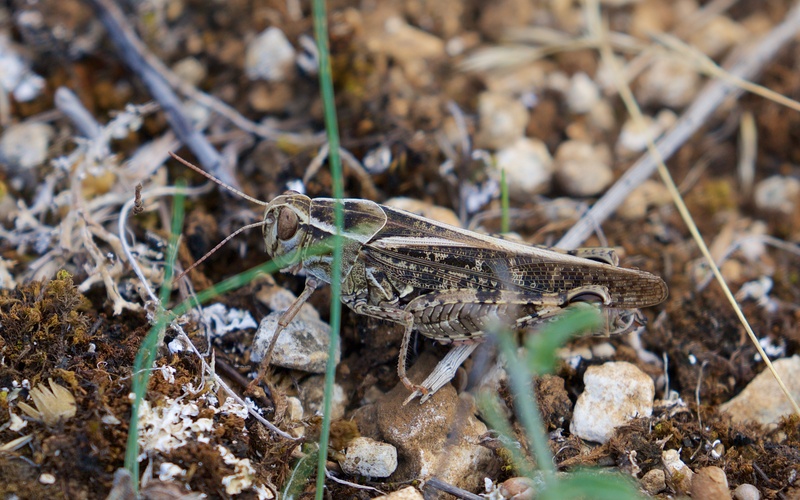 The grasshopper and cricket (Orthoptera) assemblage appears rich and interesting given the perfect ‘hopper habitat. I have no identification experience so they are unnamed for now. The day-flying moths likewise. The limits of knowledge for what are common groups of species are reached with frightening ease. 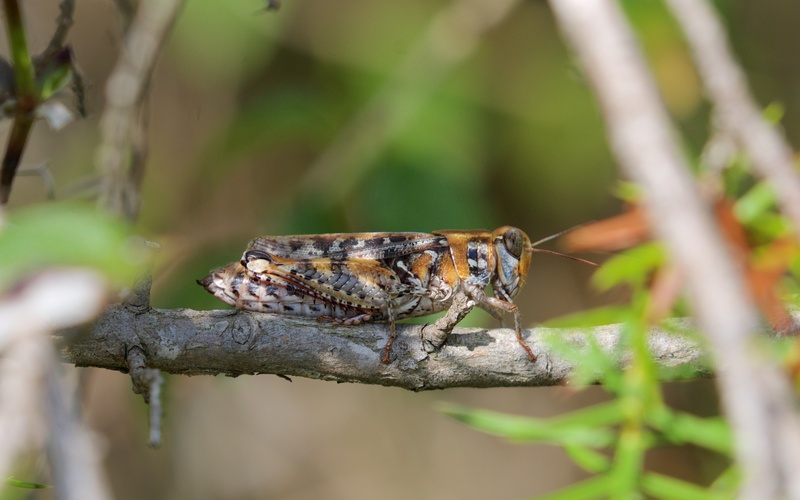 A most beautiful grasshopper species. Another beautifully camouflaged grasshopper species; it outline broken by what appear to be dead grass stems. 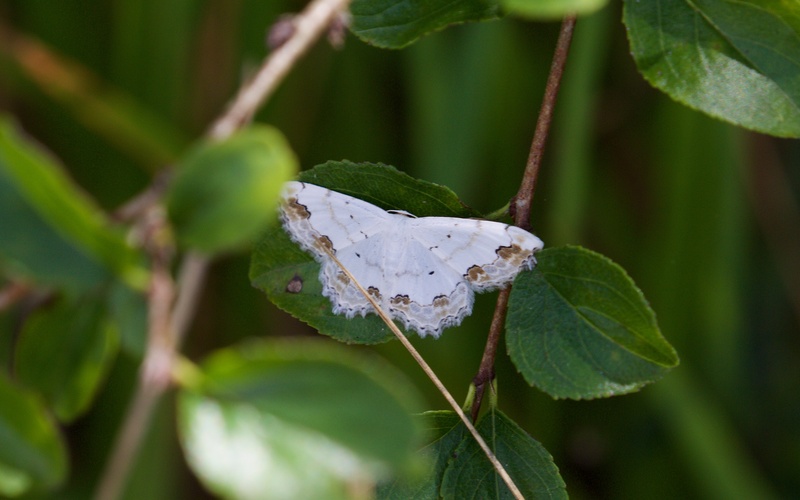 A beautiful white moth with a jewelled trailing edge to the wings. 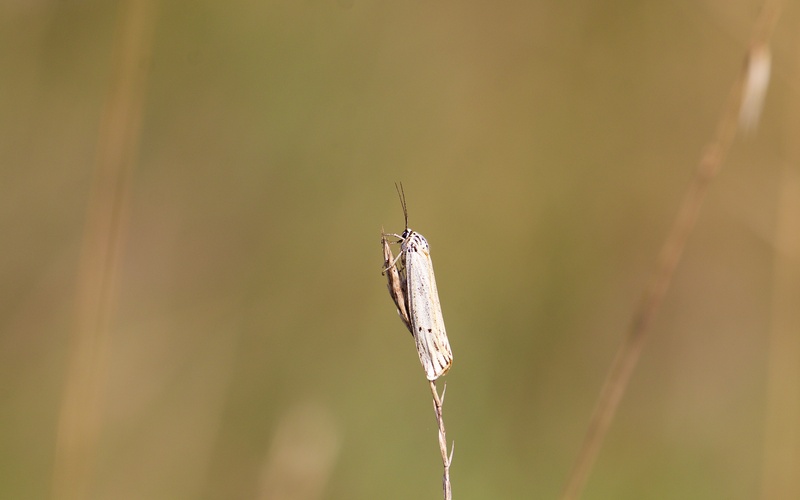 This moth was a handsome buff colour in flight but well cloaked and camouflaged when hunched on a grass head. Most of the plants are long gone; this is a place to return to in Spring and early Summer. 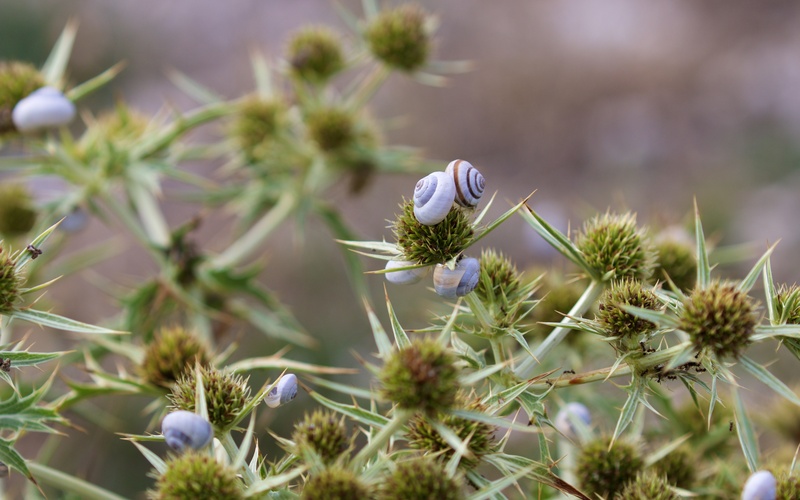 Clusters of banded snails on a thistle-like plant that is a much-branched umbellifer, field eryngo (Eryngium campestre). These create isolated clumps on the barren pseudo-steppe. 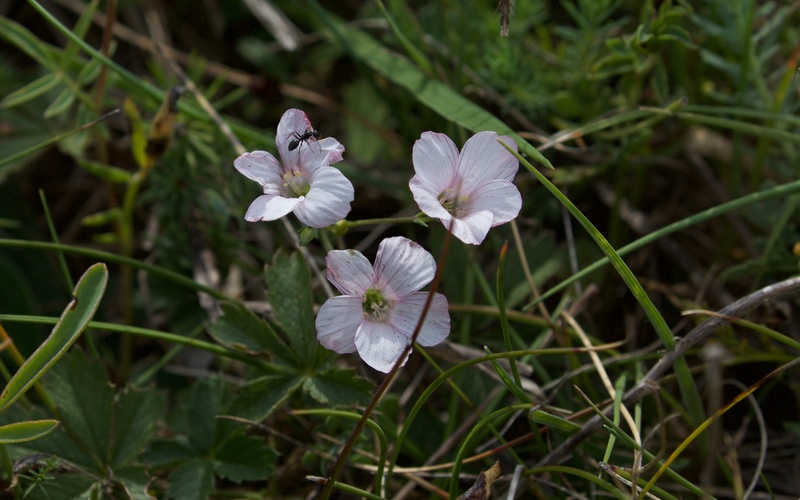 A flax species, I think Linum suffruticosum. Sounds like a lovely place. Like you, I am often frustrated by the lack of information for identifying critters away from home. Facebook groups have been useful in recent years, and now I post photos on the appropriate group just in case someone can make an ID.